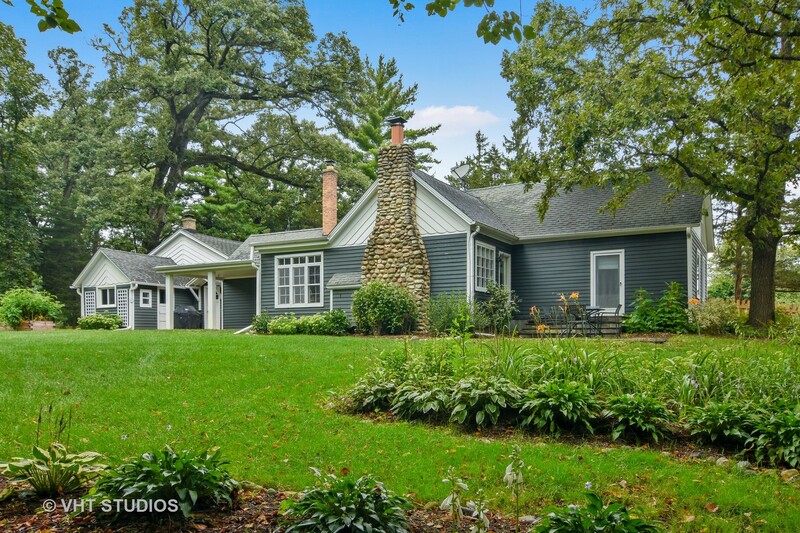 Quintessential vintage country home on 1.5 acres in Barrington Hills. A timeless blend of the one room Haeger School House (circa 1842) and modern updated amenities make this a special quaint retreat. The open floor plan offers charming chef's kitchen with Viking range, butcher block island, antique vintage cabinetry, original hardwood flooring and farmhouse sink. Open living room and dining area create a great place for entertaining. Recent professional updating includes lavish custom bathroom, expanded laundry/mudroom, and special nostalgic finishes throughout. The main floor master bedroom opens to a recently refreshed blue flagstone private patio. There's an additional bedroom on the main floor and a third one upstairs. The delightful potting room has been repurposed as a three season play room. A newly added flagstone patio opens to the beautifully landscaped fenced yard with towering Hickory and Oak trees. Over $125, 000 in new upgrades make this historical home move-in ready.